Home Affordable Refinance Program® and HARP® are registered trademarks of the Federal Housing Finance Agency (FHFA). MortgageCalculator.org is not associated with FHFA or any government program. Official information about the Home Affordance Refinance Program (HARP) is located at http://www.HARP.gov. In 2008 the housing bubble burst, and this caused home prices to go into a free fall. By the time all was said and done, many homeowners found themselves with a house whose mortgage was now higher than the total value of their home. If these homeowners tried to refinance their properties with the new lower interest rates, they found themselves getting turned down. They were turned down because almost all lenders require a loan-to-value ratio on a property to be 80% or lower to qualify for refinancing without adding on private mortgage insurance. For example, if a house was bought at $160,000 but was now only worth $100,000 after the housing bubble collapse, and the owner currently owes $120,000 on the original mortgage, the loan-to-value ratio is 120%. By adding private mortgage insurance, most homeowners found the value of refinancing null and void. 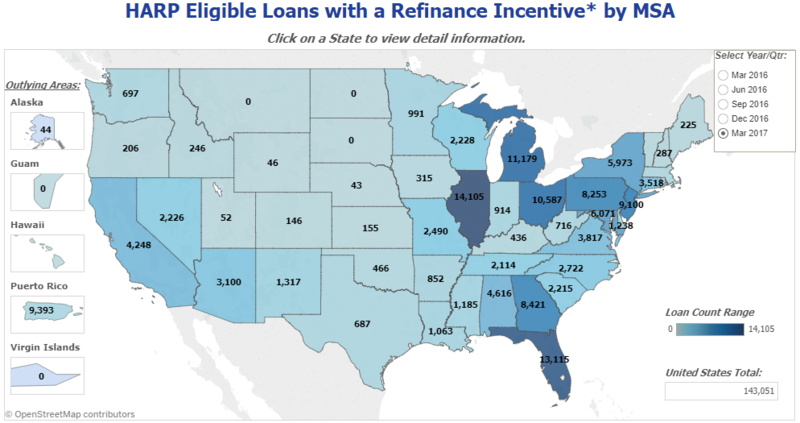 This is where the Home Affordable Refinancing Act (HARP) comes in. We will go over what this program is, how it works, who is eligible for financing, any changes to the current program, and more. You'll leave with a very good understanding of this program, and you should have a good idea if this is an option you should pursue or not. When it was originally debuted, the HARP program didn't do as well as it was projected to do because of the complex set of requirements and guidelines. When the government unveiled HARP 2.0, it became for accessible to a much wider pool of homeowners. To date, over 3.4 million people have been helped by the HARP refinancing program. They were able to apply and be accepted to modify their existing mortgages to something more affordable. This allowed them to keep their homes. As of Q1 2016 3,400,543 homeowners have been helped. The following eligibility map shows over 100,000 still qualify to join the program. For your convenience here is a rate table which shows current rates in your area. The Federal Housing Finance Agency (FHFA) created this program in March 2009 to help homeowners who were affected by the 2008 housing market collapse. It lets potential borrowers refinance their current home mortgages with minimal or no equity. The homeowners will get a more affordable mortgage rate, and they won't have to add on expensive private mortgage insurance like they would with a traditional mortgage. As long as the borrower is current on their mortgage payments and their loan-to-value ratio is above 80%, they have a good chance of qualifying for this program. If you believe you could benefit from the HARP program, you should make sure that you qualify before you begin the application process. this way, you won't waste your time going through the application process only to be denied on eligibility requirements. Your mortgage must have a current loan-to-value ratio of over 80%. This means that your home mortgage's current amount is 81% or more of your home's value. The first thing you have to look at is your current mortgage and your payment history. To be eligible for the HARP program, you must be current on your mortgage payments. Additionally, you can't have any payments that were over 30 days late in the last six months, and no more than one missed payment in the last 12 months. Any home mortgage you want to refinance through HARP must be guaranteed or owned by Frannie Mae or Freddie Mac. If you're not sure which lender has your current mortgage loan, you can check your Freddie Mac or Frannie Mae mortgage status. To be eligible for the HARP program, you can only have a conventional mortgage. Other mortgage options like the USDA, FHA, or VA home loan are not accepted into the HARP refinance program. You may only use the HARP program on the same property once. 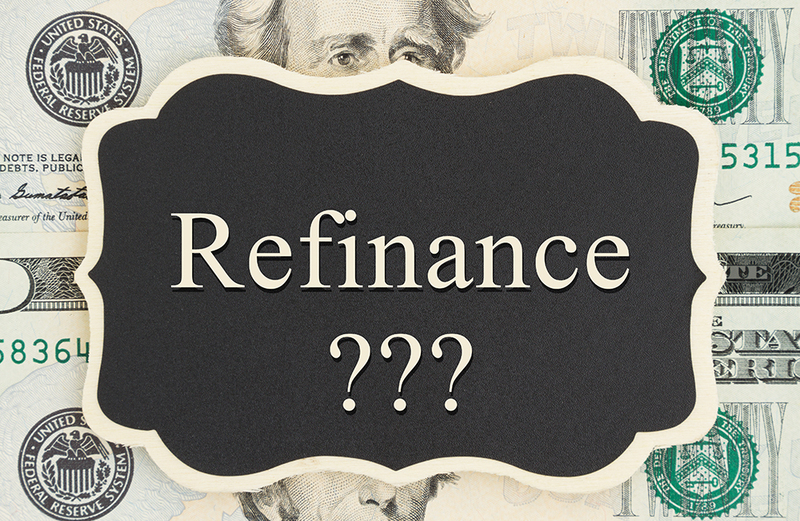 So if you've had to refinance your home through this program before, you won't be able to refinance a second time. Your mortgage loan must have an origination date on or before May 31, 2009, to meet the requirements for the loan. You can use the tools mentioned above to find your origination date, or you can call 800-7FANNIE or 800-FREDDIE between 8 am and 8 pm eastern time. The home you want to refinance with the HARP program has a few occupancy regulations you have to follow to be eligible. The home either has to be your primary residence, a single unit second home, or a one to four unit investment property.